In a search for order and sustaining that order, the olden Cherokee devised a simple, yet seemingly complex belief system. Many of the elements of the original system remain today. 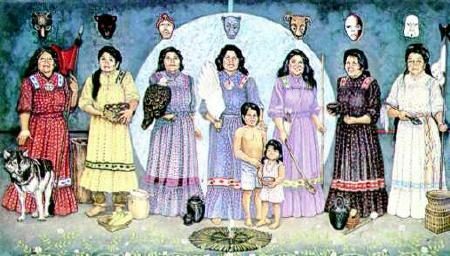 Although some have evolved or otherwise been modified, the traditional Cherokee of today recognize the belief system as an integral part of day-to-day life. Certain numbers play an important role in the ceremonies of the Cherokee. The numbers four and seven repeatedly occur in myths, stories and ceremonies. Four represents all the familiar forces, also represented in the four cardinal directions. These cardinal directions are east, west, north and south. Certain colors are also associated with these directions. The number seven represents the seven clans of the Cherokee, and are also associated with directions. In addition to the four cardinal directions, three others exist. Up (the Upper World), down (the Lower World) and center (where we live, and where ‘you’ always are). The number seven also represents the height of purity and sacredness, a difficult level to attain. In olden times, it was believed that only the owl and cougar had attained this level, and since then, they have always had a special meaning to the Cherokee. The pine, cedar, spruce, holly and laurel also attained this level. They play a very important role in Cherokee ceremonies. Cedar is the most sacred of all, and the distinguishing colors of red and white set it off from all others. The wood from the tree is considered very sacred, and in ancient days, was used to carry the honored dead. Because of these early beliefs, the traditional Cherokee have a special regard for the owl and cougar. They are the honored ones in some versions of the Creation story. They were the only two who were able to stay awake for the seven nights of Creation. The others fell asleep. Today, because of this, they are nocturnal in their habits and both have night vision. The owl is seemingly different from other birds, and he resembles an old man as he walks. Sometimes, the owl can be mistaken for a cat with his feather tufts and silhouette of his head. This resemblance honors his nocturnal brother, the cougar. The owls’ eyes are quite large and set directly in front like a persons, and he can close one independent of the other. The cougar is an animal whose has screams which resemble those of a woman. He is an animal who has habits that are very secret and unpredictable. The cedar, pine, spruce, laurel and holly trees have leaves all year long. These plants, too, stayed awake seven nights during the Creation. Because of this, they were given special power, and they are among the most important plants in Cherokee medicine and ceremonies. Traditionally, the Cherokee are deeply concerned with keeping things separated and in the proper classification, or category. For example, when sacred items are not in use they are wrapped in deerskin, or white cloth, and kept in a special box or other place. The circle is a familiar symbol to traditional Cherokees. The Stomp Dance and other ceremonies involve movements in a circular pattern. In ancient times, the fire in the council house was built by arranging the wood in a continuous “X” so that the fire would burn in a circular path. The rivers, or “Long Man,” were always believed to be sacred, and the practice of going to water for purification and other ceremonies was at one time very common. Today, the river, or any other body of moving water such as a creek, is considered a sacred site, and going to water is still a respected practice by some Cherokees. The everyday cultural world of the Cherokee includes spiritual beings. Even though the beings are different from people and animals, they are not considered “supernatural.” They are very much a part of the natural, or real, world and most people at some point in their lives, have an experience with spiritual beings. One group of spiritual beings still talked about by many Cherokees, are the Little People. They are invisible unless they want to be seen. When seen, they look very much like any other Cherokee, except they are very small, and have long hair, sometimes to the ground. The Little People live in various places, such as rock shelters, caves in the mountains, laurel thickets, etc. They like drumming and dancing, and they often help lost children. Not only physically lost, but sometimes saddened children and those who are going through the tough times of growing up. They are also known to be quite mischievous at times. The Little People need to be dealt with carefully, and it is necessary to observe the traditional rules regarding them. They don’t like to be disturbed, and they may cause a person who continually bothers them to become ‘puzzled’ throughout life. Because of this, traditional Cherokees will not investigate or look when they believe they hear Little People. If one of the Little People is accidentally seen, or if he or she chooses to show himself, it is not to be discussed or told of for at least seven years. It is also a common practice to not speak about the Little People after night fall. Traditional Cherokees also believe that after a person dies, his soul often continues to live as a ghost. Ghosts are believed to have the ability to materialize where some people can see them, although some can not. Very basic to the Cherokee belief system is the premise that good is rewarded, while evil is punished. Even though the Cherokee strictly believe in this type of justice, there are times when things happen that the system just does not explain. It is often believed that some events that are unexplainable are caused by someone using medicine for evil purposes. Witchcraft among the Cherokee is not at all like that of the non-Indian cultures. To understand and respect the beliefs of traditional Cherokees about using medicine, conjuring, and witchcraft, you must first consider the early types of Indian societies, and consider how this has remained an integral part of Cherokee culture. Today, many Cherokees still consult with medicine people regarding problems, both mental and physical. Some believe in using both Cherokee medicine and licensed medical doctors and the health care systems. Some Cherokee today, however, will not see a medicine man for any reason and refuse to acknowledge their powers. The knowledge held by the medicine men or women is very broad in spectrum. They work for years committing to memory the syllabary manuscripts passed to them by the ones who taught them. Many formulas have been documented in Cherokee syllabary writing in books ranging from small notebooks to full-blown ledgers. If the words are not spoken or sung in the Cherokee language, they will have no affect. Until the words have been memorized, the medicine person will refer to his book. This does not compromise his abilities, as modern medical practitioners often refer to reference books, too. The writings in these books are strictly guarded and anyone who is not in training is strictly forbidden to study or read the books. The words are usually accompanied by a physical procedure, such as the use of a specially prepared tobacco, or drink. Medicine people must be, and must remain, in perfect health for their powers to be at peak. Their breath and saliva contain the powers of their life-force, and are used in their medicine. As far as the witches referred to above, there are ordinary witches and killer witches. Ordinary witches are considered more dangerous since a person can never be sure he is dealing with one, and they are more difficult to counteract. They may deceive a medicine person, and cause them to prescribe the wrong cure if not guarded. One killer witch who is still spoke of often in the Cherokee Nation is the Raven Mocker .